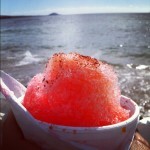 When I was in Maui last fall, I set out on a personal mission to find the island’s best Hawaiian shave ice. Hey, someone had to do it! Many had told me about Ululani’s in Lahaina. “Get it with ice cream on the bottom,” tweets read. And I thought to myself, “Bleah. Ice and ice cream mixed? Nasty!” But when I got to the window and mulled over the flavor options, I saw another order being prepared, with ice cream on the bottom. 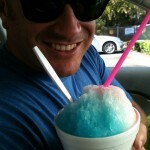 Lee and his Tobi’s Shave Ice. OK, I can do this. I ordered a small (you should see the sizes!) passion orange with macadamia nut ice cream on the bottom and a sprinkling of li hing mui powder on top. Oh. My. Goodness. I was in love! 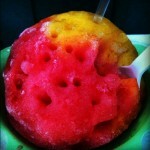 And craved that shave ice every day of my trip. I did return to Ululani’s several times. I’m not ashamed. However, as part of my mission I had to try others, and I did. I made it back to Ululani’s as often possible during my trip, and even bought my husband a t-shirt (he wasn’t with me on the trip) to remind me of the iced goodness. I long for Ululani’s and talk giddily about it to others who’ve had the pleasure to experience it. Nothing here in Florida comes close to its soft, silky texture. And then I hear about an ‘adult’ version of Hawaiian shave ice at the Sheraton Maui Resort & Spa. What? Imagine lounging by the pool or on the beach whilst indulging in Rum Rainbow, Spiked Pineapple, or Tropical Cactus. Don’t like those flavors? You can create your own! As if I needed another reason – when’s the next flight to Maui? 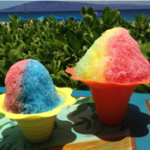 Have you had Hawaiian shave ice? Which is your favorite?